It's the middle stretch of what's becoming a gimmicky month of movies, where traditional-narrative films have taken a backseat to films with some sort of unusual element to their plot, if they even have one. This week, we're in to sequels of gimmicky movies as one of last year's surprise hits gets a second outing. Last October, essentially out of nowhere, Paramount came up with a brilliant marketing campaign for an almost zero-budget horror film called Paranormal Activity, made up entirely of camcorder footage of a supposedly haunted home. Through a focused roll-out distribution, they were able to create an old-fashioned road show type atmosphere for it, a fourth-place finish on only 160 screens, a first-place finish in its fifth week, and an eventual domestic total of about $108 million. This is Blair Witch level of profitability, so there's zero surprise that they've come out with a second film. Then again, we all remember how Blair Witch 2 turned out, right? Okay, so they're not messing with the format here as they did with that one, but once the spell is broken on this kind of film, there's not much chance of working it back up again. Some of the decisions for this sequel (well, prequel) make a lot of sense in that regard – inserting a baby and a dog into the mix of characters ads a lot more potential for scares – while others don't – do we really care that they brought back the same two actors from the first for small roles? Who even remembers them? Against all odds, reviews for the sequel are better than the first, with the added element and slightly slicker production (the budget has multiplied several times but is still just the catering budget for many Hollywood films) making it feel a lot more like a real movie, without breaking the found-footage feel of it. There's also the challenge that many of those saw the first film just have no interest in a second outing. I don't think it's going to find the same level of success in the long run, but may start out with a higher weekend than its first peak. Opening at over 3,200 venues, it should start at around $24 million. After one weekend in limited release, Hereafter rolls out into over 2,000 venues this weekend. Clint Eastwood's latest, it's a film with a rather heady topic – about life after death. 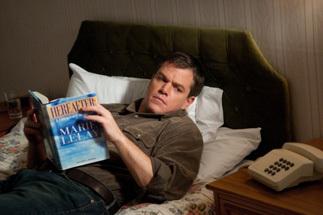 It contains three stories about people who suffer loss – a French journalist caught in a tsunami, an English boy whose brother is killed in a car accident, and a medium, in a head-scratching casting choice, played by Matt Damon, who can talk with the dead.